For other uses, see Yule (disambiguation). Yule or Yuletide ("Yule time") is a festival observed by the historical Germanic peoples, later undergoing Christianised reformulation resulting in the now better-known Christmastide. The earliest references to Yule are by way of indigenous Germanic month names Ærra Jéola (Before Yule) or Jiuli and Æftera Jéola (After Yule). Scholars have connected the celebration to the Wild Hunt, the god Odin and the pagan Anglo-Saxon Mōdraniht. Terms with an etymological equivalent to Yule are used in the Nordic countries for Christmas with its religious rites, but also for the holidays of this season. Yule is also used to a lesser extent in English-speaking countries to refer to Christmas. Present day Christmas customs such as the Yule log, Yule goat, Yule boar, Yule singing, and others stem from the original pagan Yule. A number of Neopagans have introduced their own rites. 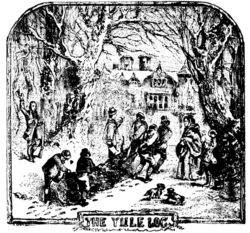 Yule is the modern English representation of the Old English words ġéol or ġéohol and ġéola or ġéoli, with the former indicating the 12-day festival of "Yule" (later: "Christmastide") and the latter indicating the month of "Yule", whereby ǽrra ġéola referred to the period before the Yule festival (December) and æftera ġéola referred to the period after Yule (January). Both words are thought to be derived from Common Germanic *jeχʷla-, and are cognate with Gothic (fruma) jiuleis; Old Norse, Icelandic, and Faroese jól; Danish, Swedish, and Norwegian jul and ýlir; Estonian jõul(ud), and Finnish joulu. The etymological pedigree of the word, however, remains uncertain, though numerous speculative attempts have been made to find Indo-European cognates outside the Germanic group, too. The noun Yuletide is first attested from around 1475. The word is attested in an explicitly pre-Christian context primarily in Old Norse. Among many others (see List of names of Odin), the long-bearded god Odin bears the names jólfaðr (Old Norse for "Yule father") and jólnir ("the Yule one"). In plural (Old Norse jólnar, "the Yule ones") may refer to the Norse gods in general. In Old Norse poetry, the word is often employed as a synonym for 'feast', such as in the kenning hugins jól (Old Norse "Huginn's Yule" → "a raven's feast"). Jolly shares probably the same etymology, but was borrowed from Old French jolif (→ French joli), itself from Old Norse jól + Old French suffix -if (compare Old French aisif "easy", Modern French festif = fest "feast" + -if). The word was first mentioned by the Anglo-Norman chronicler Geoffrey Gaimar in his Estoire des Engleis, or "History of the English People", written between 1136–40. Yule was an indigenous midwinter festival celebrated by the Germanic peoples. The earliest references to it are in the form of month names, where the Yule-tide period lasts somewhere around two months in length, falling along the end of the modern calendar year between what is now mid-November and early January. Yule is attested early in the history of the Germanic peoples; from the 4th-century Gothic language it appears in the month name fruma jiuleis, and, in the 8th century, the English historian Bede wrote that the Anglo-Saxon calendar included the months geola or giuli corresponding with either modern December or December and January. While the Old Norse month name ýlir is similarly attested, the Old Norse corpus also contains numerous references to an event by the Old Norse form of the name, jól. In chapter 55 of the Prose Edda book Skáldskaparmál, different names for the gods are given. One of the names provided is "Yule-beings". A work by the skald Eyvindr Skáldaspillir that uses the term is then quoted, which reads "again we have produced Yule-being's feast [mead of poetry], our rulers' eulogy, like a bridge of masonry". In addition, one of the numerous names of Odin is Jólnir, referring to the event. The Saga of Hákon the Good credits King Haakon I of Norway with the Christianisation of Norway as well as rescheduling the date of Yule to coincide with Christian celebrations held at the time. The saga states that when Haakon arrived in Norway he was confirmed a Christian, but since the land was still altogether heathen and the people retained their pagan practices, Haakon hid his Christianity to receive the help of the "great chieftains". In time, Haakon had a law passed establishing that Yule celebrations were to take place at the same time as the Christians celebrated Christmas, "and at that time everyone was to have ale for the celebration with a measure of grain, or else pay fines, and had to keep the holiday while the ale lasted." Yule had previously been celebrated for three nights from midwinter night, according to the saga. Haakon planned that when he had solidly established himself and held power over the whole country, he would then "have the gospel preached". According to the saga, the result was that his popularity caused many to allow themselves to be baptised, and some people stopped making sacrifices. Haakon spent most of this time in Trondheim. When Haakon believed that he wielded enough power, he requested a bishop and other priests from England, and they came to Norway. On their arrival, "Haakon made it known that he would have the gospel preached in the whole country." The saga continues, describing the different reactions of various regional things. It was ancient custom that when sacrifice was to be made, all farmers were to come to the heathen temple and bring along with them the food they needed while the feast lasted. At this feast all were to take part of the drinking of ale. Also all kinds of livestock were killed in connection with it, horses also; and all the blood from them was called hlaut [ sacrificial blood ], and hlautbolli, the vessel holding the blood; and hlautteinar, the sacrificial twigs [ aspergills ]. These were fashioned like sprinklers, and with them were to be smeared all over with blood the pedestals of the idols and also the walls of the temple within and without; and likewise the men present were to be sprinkled with blood. But the meat of the animals was to be boiled and served as food at the banquet. Fires were to be lighted in the middle of the temple floor, and kettles hung over them. The sacrificial beaker was to be borne around the fire, and he who made the feast and was chieftain, was to bless the beaker as well as all the sacrificial meat. The narrative continues that toasts were to be drunk. The first toast was to be drunk to Odin "for victory and power to the king", the second to the gods Njörðr and Freyr "for good harvests and for peace", and thirdly a beaker was to be drunk to the king himself. In addition, toasts were drunk to the memory of departed kinsfolk. These were called minni. Modranicht, an event focused on collective female beings attested by Bede as having occurred among the pagan Anglo-Saxons on what is now Christmas Eve, has been seen as further evidence of a fertility event during the Yule period. The events of Yule are generally held to have centred on Midwinter (although specific dating is a matter of debate), and feasting, drinking, and sacrifice (blót) were involved. Scholar Rudolf Simek comments that the pagan Yule feast "had a pronounced religious character" and comments that "it is uncertain whether the Germanic Yule feast still had a function in the cult of the dead and in the veneration of the ancestors, a function which the mid-winter sacrifice certainly held for the West European Stone and Bronze Ages." The traditions of the Yule log, Yule goat, Yule boar (Sonargöltr) still reflected in the Christmas ham, Yule singing, and others stem from Yule customs, and customs which Simek takes as "indicat[ing] the significance of the feast in pre-Christian times." In modern Germanic language-speaking areas and some other Northern European countries, historical cognates to English yule denote the Christmas holiday season. Examples include Jul (Sweden), Jul (Denmark), Jul/Jol (Norway), Jól (Iceland and the Faroe Islands), Joulu (Finland), Joelfest (Friesian), Joelfeest (Dutch) and jõulud (Estonia). As forms of Neopaganism can be quite different and have very different origins, these representations can vary considerably despite the shared name. Some celebrate in a way as close as possible to how they believe Ancient Germanic pagans observed the tradition, while others observe the holiday with rituals "assembled from different sources". In Germanic Neopagan sects, Yule is celebrated with gatherings that often involve a meal and gift giving. Groups such as the Asatru Folk Assembly in the US recognise the celebration as lasting 12 days, beginning on the date of the winter solstice. In most forms of Wicca, this holiday is celebrated at the winter solstice as the rebirth of the Great horned hunter god, who is viewed as the newborn solstice sun. The method of gathering for this sabbat varies by practitioner. Some have private ceremonies at home, while others do so with their covens. Dísablót, an event attested from Old Norse sources as having occurred among the pagan Norse. Mōdraniht, an event attested by Bede as having occurred among the pagan Anglo-Saxons on what is now Christmas Eve. Saturnalia, an ancient Roman festival in honour of the deity Saturn, held on December 17 and expanded with festivities through December 23. ↑ For a brief overview of the proposed etymologies, see Orel (2003:205). ↑ T. F. Hoad, English Etymology, Oxford University Press, 1993 (ISBN 0-19-283098-8). ↑ Simek (2007:180—181 & 379—380) and Orchard (1997:187). ↑ Hutton, Ronald (December 2008). "Modern Pagan Festivals: A Study in the Nature of Tradition". Folklore. Taylor & Francis, Ltd. on behalf of Folklore Enterprises, Ltd. 119 (3): 251–273. doi:10.1080/00155870802352178. JSTOR 40646468. ↑ McNallen, Stephen The Twelve Days of Yule – 2005 Archived 9 January 2007 at the Wayback Machine. ↑ James Buescher (15 December 2007). "Wiccans, pagans ready to celebrate Yule". Lancaster Online. Retrieved 21 December 2007. ↑ Andrea Kannapell (21 December 1997). "Celebrations; It's Solstice, Hanukkah, Kwannza: Let There Be Light!". NYtimes.com. Retrieved 21 December 2007. Bosworth, Joseph; Toller, T. Northcote (1898). An Anglo-Saxon Dictionary. Oxford: Oxford University Press. Guðbrandur Vigfússon (1874). An Icelandic-English Dictionary: Based on the Ms. Collections of the Late Richard Cleasby. Clarendon Press. Hoad, T. F. (1996). The Concise Oxford Dictionary of English Etymology. Oxford: Oxford University Press. ISBN 0-19-283098-8. Orel, Vladimir (2003). A Handbook of Germanic Etymology. Leiden: Brill Publishers. pg. 205. ISBN 90-04-12875-1.